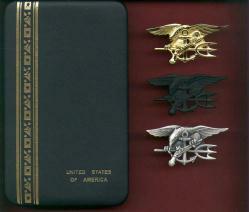 Set of Three Genuine Navy Seal Badges Tridents in case. Gold, Silver, and Subdued Combat Black. Made in the USA. Guaranteed Genuine. Makers mark on the back to show they are genuine. Beware of illegal fakes offered by non-US sellers at discount prices.